All is good. Unit is clean and easily accessible.Great perk that I got a free lock and key. People work there are very friendly and helpful. The location is great and very easy to find. This gated storage is very clean and secured. They also provide dolly for customer. People who work there are very professional and friendly. Overall I had a great experience and would like to recommend to people who I know! Agent was great, facility is easy to get in and out, price is good. Needed a temp facility to store quite a bit of 10 years worth of junk until our house closed near the end of the month. I worked with Mike and he was most helpful. The rental is a month to month plan without any long leases to sign. We drove two 26' Penske trucks to the storage units with plenty of room to maneuver. Great place. Check in was easy and quick. Very friendly staff. Unit easy to find. Buildings are numbered. Lots of room to park and unload. Price is fair, about average. I have already recommended this location to a friend. I rented a storage shed from Rangeline several years ago. I was very impressed then. So when I found I needed another storage shed, it was a no brainer. I have never had something go so easy in my life!!! 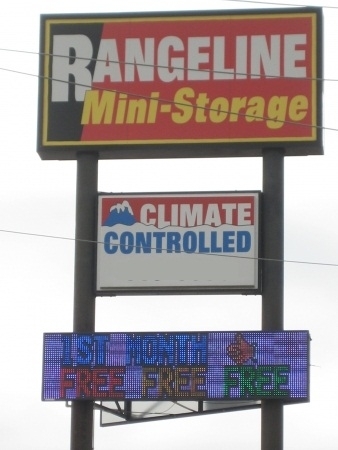 I looked up storage units and Rangeline seemed to be the best deal so I drove up there to see if the deal was as good as it sounded. I could not have had a better experience if I had planned it. I was in and out within 10 minutes with all my questions anwered.. Mr. Lewis Golden is awesome and I will be reccomending Rangeline Storage to all I can!! !